So often, the real reason we are not living the life of our dreams is because there are unresolved issues from the past that hold us back, that keep us tied to old wounds and negative emotions. Release anger, grief, and other negative emotions. Open your heart energy to allow more grace to flow to you. Increase happiness, joy, and creativity. Release past vows that currently restrict your life. Heal physical and emotional issues. Now you can be Divinely Guided every day with ease and grace. “It’s no accident, but rather divine timing, that Lisa has written this book now when so many have unanswered questions. By simply reading a prayer, every page of this book can transform you almost effortlessly from where you are to where you feel loved and supported. “During the many sessions I’ve enjoyed with Lisa Barnett as my guide and catalyst to the Akashic Masters, I always feel the presence of the Akashic Beings of Light. Now with the gift of this book that Lisa has so generously given us, I can open to any page and immediately feel that presence. 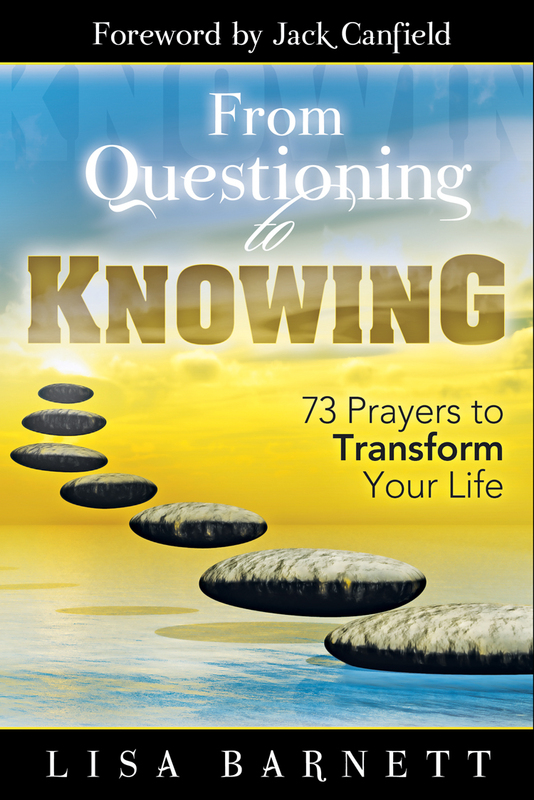 “Guided once again by the Akashic Masters, bestselling author Lisa Barnett brings us her second book, From Questioning to Knowing: 73 Prayers to Transform Your Life.